Cable sheath repair systems in a choice of technologies to repair all damaged cables including heat shrink cable repair, cold shrink cable repair, electrical tape and insulating resin based repair solutions for low and high voltage cables. Cable repair and sheath repair kits are available to repair damaged power, control and instrumentation cables including Oil, Gas & Petrochemicals, Offshore & Marine, Mines & Quarries, Rail & Tunnels, Distribution & Transmission, Building Services, Street Lighting, Renewable Energy, Airports, Port Authorities and Utilities. 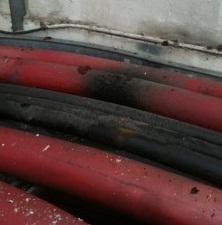 Pictured Below: is clear damage to the red cable sheath of a 11kV high voltage power cable which suffered an HV cable fault - the damaged 11kV cable was contained on high level cable ladder racking. 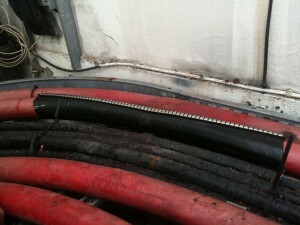 The power cable sheath had been degraded due to exposure to gases and emissions from a nearby diesel generator exhaust system. Heat shrink cable sheath repair kits were used to re-instate the cable sheath - the lay-flat "wraparound" design of the cable sheath repair kits enable cable repairs to both LV and HV power cables without disconnecting cables. Cable repairs can be carried out on damaged XLPE, PILC, EPR, PE and low voltage utility mains and service cables (Waveform, Consac, Split & Concentric) - cable repair kits suit high voltage power cables 3.3kV, 6.6kV, 11kV, 25kV and 33kV, including Triplex.